Submitted 11 months 2 weeks ago by FeedsFloor. Are you exhibiting with a group of companies at a trade show? Or do you organize a large event or exhibition? 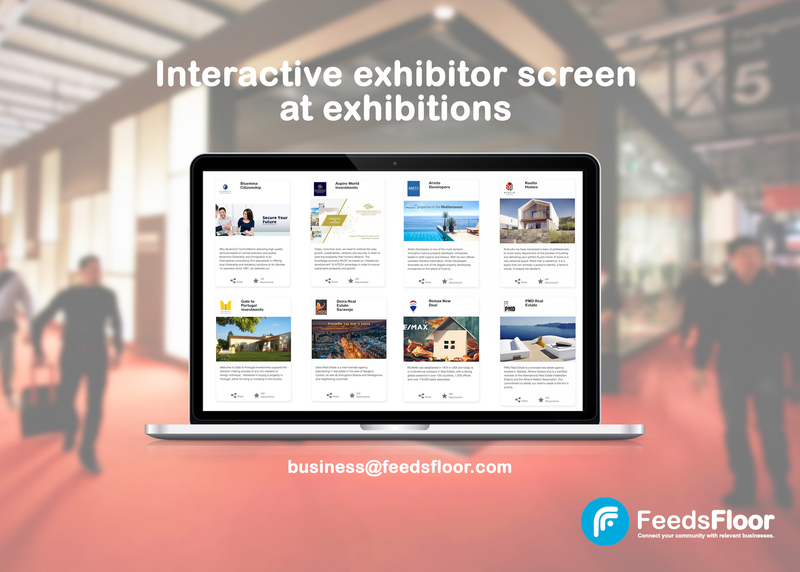 Now you can link your physical exhibition with a digital showroom via interactive exhibitor screens. 1. All companies and their products and services are shown under one page. 2. Visitors can get an easy overview and investigate on the spot all the companies and their offerings. 3. Visitors can sign up on the spot to automatically get updates from the companies, when they come home. 1. No more of just showcasing banners with logos, that does not mean anything to visitors. 2. Visitors are reminded of and can take contact to companies and their offerings also after an exhibition. And the best thing is that exhibitors keep their profiles up to date themselves and can be shown for as long as you want online.